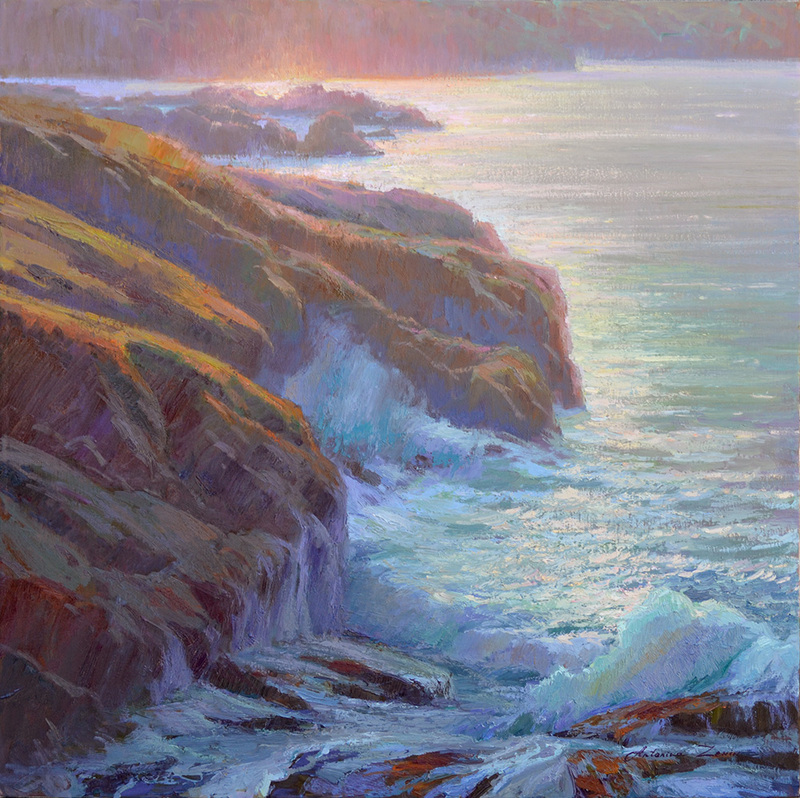 The California Art Club and the Carmel Visual Arts will present the exhibition Point Lobos and Beyond at the Carmel gallery from October 19 to November 30, 2018. Saturday, Oct. 19, from 2 to 4 p.m. I am thrilled to be participating in the American Impressionists Society again this year. The show runs from September 27 through October 27 and features 170 juried works that represent the best in American Impressionist art being produced today. Saturday, May 19, 2018; 11:00am – 5:00 p.m.
On Friday evening, artists will bring their freshly painted entries to Mission Street for first viewing during an "invitation only" VIP Wine Reception between 7-9 PM for past art buyers. The street is blocked off. On Saturday, the Plein Air competition starts out with judging of the 120 entries, followed by the silent auction until 6:00PM. In Devendorf Park: Purchase posters from this and past years events. Listen to live music. Stroll around the Sculpture-in-the-Park exhibits by galleries around town. On Sunday morning at Devendorf Park starting at 9:00 AM, a 2-hour Quick Draw by the winning artists will be held. Mostly, artists can be seen painting around Carmel-by-the-Sea and Carmel Beach. This is followed by a half-hour silent auction between 11:00AM to 12 NOON. Throughout the day, purchase posters from this and past years events. Listen to live music. Stroll around the Sculpture-in-the-Park exhibits by galleries around town. On Sunday morning on Mission Street, from 8:00AM to 3:00PM, an additional 100+ paintings will be up for sale, those that the 60 artists painted during festival week, but were not part of the competition. These are being sold at a set price. Tonya's painting "Tranquil Morning" has been selected for the 19th AIS National Show. This year, only 175 artists were juried into the exhibition out of 1,430 entries. The painintg is curently on display at Montgomery Lee Fine Art. Contact the gallery if you are interested in buying this painting. Rocky Point, 12x16, oil on linen. Plein Air painting. Tonya's painting "Rocky Point" has been selected for the inaugural "AIS Impressions: Small Works Showcase"
Click here to view the video and click here to view the photo album. To view the entire exhibition online along with a list of the award winners, click here. The show is at Randy Higbee Gallery in Costa Mesa, California. This sweeping collection of landscapes are the work of nineteen nationally known Bay Area artists. Organized around the theme Field to Studio, the paintings celebrate the diversity found in Northern California's terrain: the vineyards of Napa and Sonoma, the Sierra Mountains and Foothills, Gold Country, Peninsula estuaries, and vistas of the Pacific Coast. Building upon the California Impressionism movement of early 20th century artists whose work was created outdoors in natural light, oren plein air, this group represents a second generation seeking to capture a location's color, atmosphere and feelings rather than its specific physicality. The artist may choose to create a piece in the field, or expound upon and reimagine it in the studio, creating a novel work of natural wonder. Peninsula Museum of Art is honored to feature such a prestigious group of artists in this exhibition. They are represented by galleries throughout the country and have been featured in Plein Air Magazine, Southwest, and Fine Art Connoisseur. Participants include: Simon Addyman, Bill Cone, Kevin Courter, Tim Horn, Ellen Howard, Paul Kratter, Jeanette LeGrue, Richard Lindberg, Kim Lordier, Will Maller, Wayne McKenzie, Jim McVickers, Clark Mitchell, Terri Mura, Carol Peek, Michael Readon, Randy Sexton, Bryan Mark Taylor and Tonya Zenin. The artist may choose to create a piece in the field, or expound upon and reimagine it in the studio, creating a novel work of natural wonder.